Maisaa Nasrallah, Senior Consultant at Lloyd's Register (LR) and Country Coordinator for the Institution of Occupational Safety and Health (IOSH) describes the strides taken to limit injuries caused by work at height in the United Arab Emirates (UAE), and the challenges that lie ahead. As 2013 drew to a close and we welcomed a new year, we sat and contemplated our resolutions for the coming year, preparing for the challenges ahead. The road to providing safe and healthy work environments has been a tumultuous one and as regulators, employers and workers alike we must ask ourselves the tough question: where do we go from here? Examining occupational health and safety performance on a worldwide scale, it is unfortunate to see that work at height remains the number one killer despite having regulatory frameworks in place, technologically advanced processes and awareness campaigns across the different industries. Unfortunately, this is not only true in the UK. Surveys conducted by the Health Authority of Abu Dhabi (HAAD) paint a similar picture closer to home, where HAAD has attributed more than 50% of fatal occupational injuries to falls from height and falling objects between 2008 and 2010. See Figure 1. Later in 2011, HAAD reported 26 fatalities attributed to work at height, accounting for 36% of all reported fatal occupational injuries in the Emirate. Myth: Work at height refers to work at levels that are at least two metres from the ground. Reality: Work at height really refers to working in any place where, if precautions and care are not taken, a person could fall and injure themselves. This includes places above, at or below ground level. A person doesn’t have to fall from a great height to be hurt or suffer a fatal injury. Serious injuries can and do occur from falls below head height and according to one insurance company, 59% of major injuries occur following a fall from height of less than two metres. Myth: Work at height is a high risk only in the construction sector. Reality: Working at height is a high risk activity that exists in almost all workplaces, from putting up decorations in an office environment to agricultural work on date farms, climbing on top of chemical tankers, to large scale oil and gas platforms. While it is clearly a more evident risk in construction and industrial settings, it is a risk that exists even in our own households, whether it’s window cleaning, painting and/or routine maintenance work. That said, one cannot deny the fact that work at height is an inherent risk in the construction sector, where further HAAD studies demonstrate that 59% of all occupational fatal falls occur at construction sites. This alarming figure is strongly influenced by the nature of construction sites that are largely ruled by a tight schedule, an influx of workers with different levels of competence, combined with harsh environmental conditions at times. See Figure 2. In the UAE, we are very fortunate to be working in an environment where the health and safety culture is growing as fast as the skyline. With tremendous support and investment from government authorities, organisations and professionals across a wide variety of sectors, health and safety has become a round table topic with accessible resources. Next we examine some of the key developments. The last decade has proven to be one of the most crucial for the development of occupational health and safety legislation across the UAE. In 2009, HH Sheikh Mohammed Bin Zayed Al Nahyan, Crown Prince and Chairman of the Executive Council, passed Decree No (42), Concerning the Development of the Abu Dhabi Environment Health and Safety Management System Regulatory Framework (AD EHSMS RF). He also created the Abu Dhabi Environment Health and Safety Center (AD EHS Center) as the Competent Authority overseeing the development and implementation of the framework across the Emirate. The AD EHSMS RF has been a crucial instrument in driving forward occupational health and safety standards across the Emirate where it has introduced mandatory management system requirements, developed reporting mechanisms to the regulators to support the collation of occupational health and safety data, and included technical guidance through the release of 62 mandatory Codes of Practise (CoP) covering a wide range of topics such as ‘Barricading Hazards’, ‘Work at Height’ and ‘Scaffolding’. Figure 3 below shows an overview of the AD EHSMS RF structure, while the full documentation can be accessed on www.oshad.ae. Another great initiative has been driven by the Ministry of Labour (MoL) in Dubai in coordination with international professional organisations such as IOSH and the International Institute of Risk Management (IIRSM), to form focus groups tasked with the review of existing legislation across the industrial and construction sectors, as well as develop technical requirements for the inspection, use and maintenance of lifting equipment. 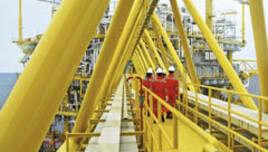 Starting in 2008, HAAD teamed up with local authorities such as the Abu Dhabi EHS Center and international organisations such as IOSH to develop ‘Height Aware’, a programme of free resources for business owners, health and safety professionals and workers alike raising awareness of the dangers of working at heights and the risks of falling objects. Integrating international best practise with local regulation, the campaign provides interactive multilingual materials free of charge, intended to provide training, awareness and educational resources for employers, supervisors, health and safety professionals and workers on site. The UAE has a growing network of occupational health and safety professionals and in driving improved health and safety standards across different sectors, it is crucial to build on the competence of the technical pool available and ensure succession planning. International organisations such as IOSH, IIRSM and the American Society of Safety Engineers (ASSE) all have established regional support to their members through branch meetings, conferences and networking opportunities. The IOSH Middle East branch was inaugurated in 2006 and since then has attracted more than 1,200 professionals in the region. Conducting regular events between Abu Dhabi and Dubai, the branch aims to provide support to members and non-members alike through sharing industry best practise, practical experiences and providing opportunities to support regulators and organisations to achieve improved standards for all working professionals. While we have certainly achieved significant progress, we cannot simply rely on having legislative requirements in place and send workers on training courses and assume it is a job well done. Let’s revisit the hierarchy of controls and identify what areas we should now target in order to bring down the level of risk associated with work at height to a level that is As Low As Reasonably Practicable (ALARP). Admittedly, the road to elimination is neither easy nor practical at times. One crucial aspect to eliminating the need to work at height lies at the early stages of planning, where designing in safety considerations is the most effective way to reduce the level of risk – and is perhaps the least utilised mechanism thus far in the region. Safety in design is a cradle to grave approach with the purpose of eliminating or reducing the risk at source through applying a combined effort between developers, designers and contractors alike to identify the risks associated with the different stages of an activity, all the way from its construction, installation, operation, and maintenance leading all the way up to demolition and/or decommissioning. As each worksite is different and comes with unique risks to different groups of people, work at height considerations should be adapted to the specific conditions of the premises and the type of activity expected. For instance, is it possible to design in permanent access platforms for both operational and maintenance activities in an industrial setting? If not, has the design considered space allocation for the use of temporary platforms such as scaffolding, or perhaps mobile equipment? Another approach may be to optimise the process in a way where we minimise exposure duration, or perhaps the number of people required to work at height at one point. While a designer cannot be expected to consider all possible uses of their design, this is where consultation with different professionals from the construction, operation, and maintenance is essential. Great insight can be gained by examining incident records and lessons learned from similar activities and/or designs which not only benefits the site, but also promotes sharing best practise among industries and different professions. There has been a massive push to improve occupational health and safety standards in the region and to provide healthy and safe working environments for professionals from all walks of life. As government authorities move into developing the legislative frameworks and conducting targeted awareness campaigns, we must step up from merely complying with legal requirements to understanding the intention behind these requirements. We must also go further to improve standards and performance across the region. Taking safety into consideration at the early planning stages of activities and designing it into facilities, processes and tasks is the key to improving the quality of life and work in the region, and in doing so we move from resorting to ‘safety first’ slogans, and aim for a more realistic approach of making it fit seamlessly alongside profitability, quality and productivity. Having been fortunate to witness the development of an occupational health and safety culture in the region over the last decade, I feel confident that the future holds great strides for the profession. While we still have challenges to conquer, can we as clients, developers, designers, contractors and occupational health and safety professionals alike strive for the best, biggest and safest?